This type of energy is formed because of the kinetic energy in water due to its fast motion. New forms of energy are created, mainly being electricity, which is of great significance in our daily life, including home, industry, commercial areas, etc. Dams produce enormous cheap energy because of this characteristic of water. Therefore, countries which have such sources of power can be at a great advantage due to availability of an economical source of energy. In the early stages when science was in primitive stages, water wheels functioned on this principle and created energy to operate machinery. Wind is another source of alternate energy that has been provided by nature without any charge. 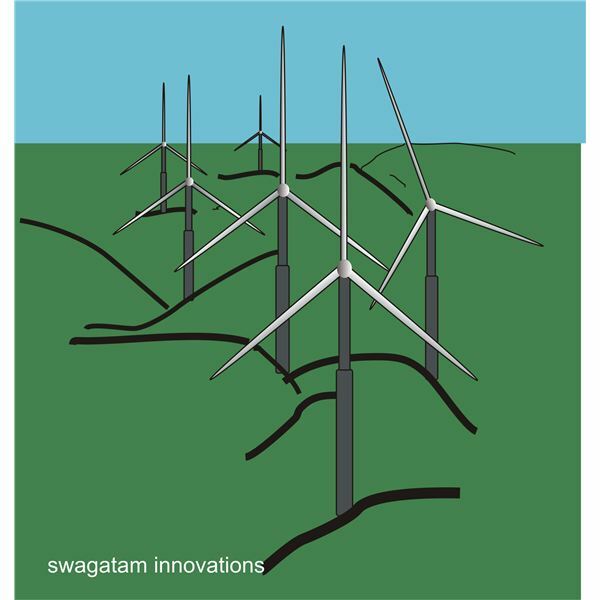 Here, wind power is harnessed and made to rotate large set propellers attached to an alternator, which ultimately convert the applied wind power to electricity. Wind energy is thus changed by windmills into electricity and also other types of energy, which can be beneficially utilized for multiple purposes. Solar energy is a very significant source of alternate energy which is available in abundance, especially in those countries where sunlight is present most of the time during a day. Presently, extensive research is being carried out by scientists and engineers to develop this source of alternate energy. Being in the initial stages, it is expensive, but as development and production increases, solar energy will become a cheap source of energy. Currently, most of the energy of the sun is not being utilized and is being wasted. The earth produces a substantial quantity of heat, such as molten rock, volcanic emission, vapors, fog, etc., and the energy available can be combined and utilized by changing into new forms of energy, such as electricity. In the first system hot steam is allowed to directly pass through a compartment having generator turbines, which start rotating under its pressure to generate electricity. The steam ultimately condenses to form water as a byproduct. In the second type the hot geysers are “flashed” and converted into pressurized steam jet which again is used to run the turbines of an alternator. The third process also called the binary system incorporates heat exchangers, where the heat from a geothermal source (hot water) is used to heat a second liquid such as isobutene, which has got comparatively low boiling point and therefore is transformed into steam quickly even at ordinary temperatures. The accumulated steam pressure is finally used to drive generator turbines to produce electricity. Nuclear energy is produced by forceful nuclear reactions, due to which energy is released that is combined and changed into electricity. However, there are environmental concerns regarding the production of nuclear energy since consequential polluted products are extremely harmful, lethal and poisonous for human beings and agriculture. In spite of being dangerous, many countries are using nuclear power as an essential form of alternate energy. Note: That nuclear energy should be described as renewable is debatable. For a balanced look at both sides of the issue, please see Is Nuclear Energy a Renewable Resource? Among the major six renewable energy sources Generating electric power from sea ebbs is probably the most promising renewable method which can be harnessed plentifully across the sea shores. We all know and have witnessed the massive power of sea waves; this ebbing, if properly channelized, produces perfect piston effect to drive an alternator, generating a continuous flow of electricity. This particular resource becomes more interesting because of its evergreen availability, irrespective of climatic variations.